The U.S. Department of Housing and Urban Development recently granted Isle de Jean Charles $48 million to relocate, making the community the first officially recognized climate refugees in the United States. (Image Credit: Wikimedia Commons). In southern Louisiana, sea level rise swallows a swath of land the size of Manhattan every year. Down in the bayou, the Gulf of Mexico is slowly flooding a network of marshes and low-lying islands peppered with tribal settlements. The U.S. Department of Housing and Urban Development recently granted $48 million to one such bayou community, Isle de Jean Charles, to relocate, making the community the first officially recognized climate refugees in the United States. Relocation is set to begin as early as 2019. In its heyday, Isle de Jean Charles was home to roughly 400 people, most of whom had Native American heritage and hailed from the Biloxi-Chitimacha-Choctaw tribe. Many were watermen by trade, and they subsisted on the marsh’s bounty of shrimp and shellfish. But over the past 60 years, Isle de Jean Charles has lost 98 percent of its land area. The rising tides began in earnest in the 1970s when the construction of canals and oil pipelines diverted water into the forests, fields, and marshes surrounding the island. More recently, a series of strong storms, including Hurricanes Katrina, Rita, and Ike, have besieged the region. In addition to storm damage, environmental degradation caused by the Deepwater Horizon oil spill, and wetland destruction has put an increasing strain on the community. 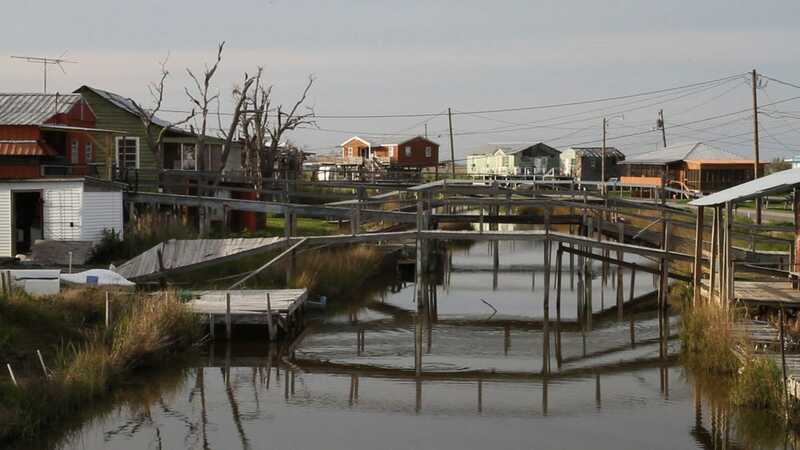 Over the past 60 years, Isle de Jean Charles has lost 98% of its land area to rising seas. Strong storms and flooding have caused many residents to relocate. (Image Credit: Karen Apricot). Following these changes, the town’s population shrunk; now only 25 families remain. The exodus has hollowed out the island community, and the remaining residents—die hard watermen and their families—are relocation holdouts. While Isle de Jean Charles appears destined for a waterlogged future, there is hope that the community will live on. The remaining families have received federal funding to start over in a new environment. Located 30 miles inland, the new community will be surrounded by forests, marshes, and open fields, similar to the Isle de Jean Charles of old before the intrusion of the sea. (Video Credit: Go Project Films).